Clever quote on a decorative can bringing some humour to the watering duties. Holds up to 0.75 gallons of water. 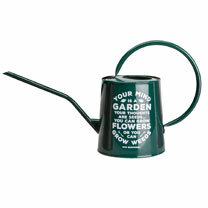 The single spout allows for a direct stream of water giving you more control for your plants.